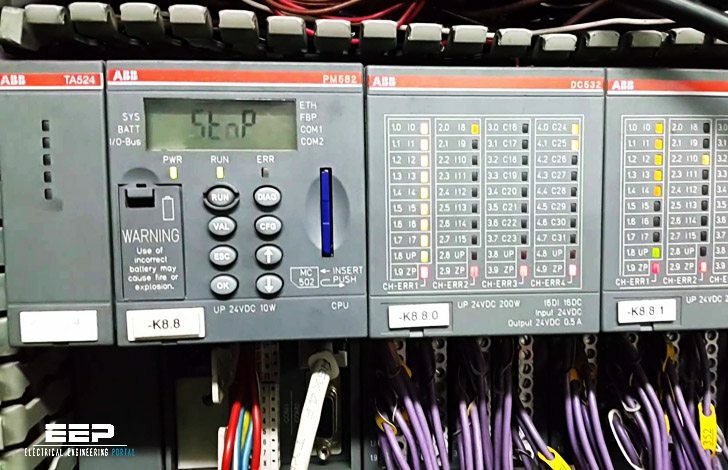 The cabling of the industrial communication systems (Modbus RS485) is different in some ways from the cabling used for power cabling and the electrician may experience some difficulties if he is not an expert in Modbus communication networks. A Modbus RS485 connects a Master device to one or more Slave devices. Henceforth, we shall consider Slave devices to be measuring instruments with serial communication, even if the cabling is similar for all Modbus devices. Each device has a communication port with two terminals, which are indicated for the sake of convenience as A and B. In these two terminals the communication cable is connected so that all the devices that take part in the communication are connected in parallel. All the ‘A’ terminals must be connected together and all the ‘B’ terminals must be connected together respectively. Inverting the ‘A’ and ‘B’ connections of a device does not only prevent it from communicating but may also stop the entire communication system from working owing to incorrect direct (polarisation) voltage found on the terminals of the incorrectly connected device. In order to avoid errors when many devices are connected, cables of the same colour should be used for all the connections to the terminals A and cables of the same colour should be used for all the connections to the terminals B of the various devices (e.g. white for A and blue for B). This makes it easier to identify cabling errors. The communication port on the Master device, whatever it is, has two terminals that correspond to A and B. Unlike what happens in many energy distribution systems, the manner in which the devices are connected in parallel is important. The RS485 system used for Modbus communication provides a main cable (Bus or backbone), to which all the devices have to be connected with branches (also known as stubs) that are as short as possible. The branches must be no longer than 1200 m! Longer branches could cause signal reflections and generate disturbances and consequent errors in the reception of data. 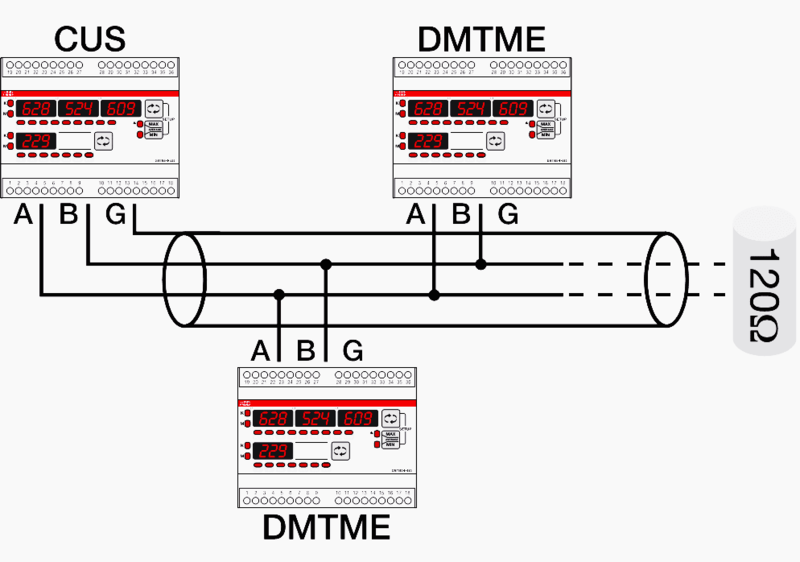 Figure 1 shows an example of a correct Bus connection. The main cable must be no longer than 700 m! This distance does not include the branches (which must nevertheless be short). The maximum number of devices that can be connected to a main cable is 32, including the Master. In order to increase the extent of the Modbus network, repeaters can be used; and signal amplifying and regenerating devices provided with two communication ports that transfer to each what they receive from the other. Using a repeater, the main cable is divided into different segments, each of which can be up to 700 m in length and connect 32 devices (this number includes the repeaters). The maximum number of repeaters that should be serially connected is 3. A higher number introduces excessive delays in the communication system. The cable to be used is a shielded twisted pair (telephone type). For example, Belden 3105A cable can be specified, but different types of cable with equivalent characteristics can be used. The twin consists of two conductors that are twisted together. This arrangement improves immunity to electromagnetic disturbances because the cable forms a series of successive coils, each of which faces in the opposite direction to the next one: in this manner any magnetic field in the environment traverses each pair of coils in opposite directions and its effect is thus very reduced (theoretically, the effect on each coil is exactly the opposite of the effect on the next one and thus the effect is cancelled). 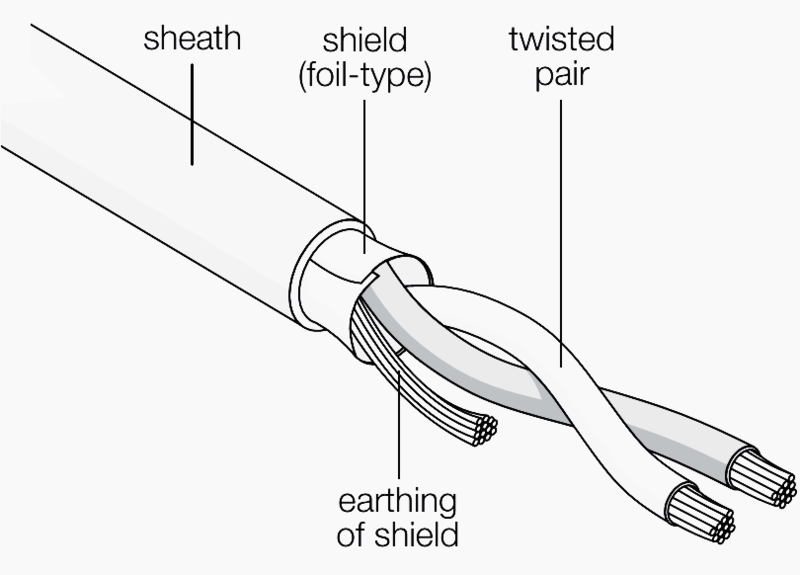 The shielding may be braided (be formed by a mesh of thin conducting wires) or be a foil (consisting of a sheet of metal wound around the conductors): the two types are equivalent. In some countries, inserting two cables into the same screw terminal is permitted. In this case it is possible to connect the main inlet and outlet terminal directly to the terminals of an instrument without creating a branch. If on the other hand each terminal can accept only a single cable, a proper branch must be created using three auxiliary terminals for each instrument to be connected. The cable shield must be earthed only in one point. Normally, this connection is made at one end of the main cable. In order to avoid signal reflections, a 120 Ohm termination resistance must be fitted on each end of the main cable. The end resistance must be used only at the ends of the main cable. If the total length of the main cable is less than 50 m termination resistances can be avoided at the ends of the main cable. If the master used is a personal computer, in general an RS232/RS485 serial converter provides the connection to the bus. Every one who writes about RS 485 only writes the rules.No one write the engineering behind it. Why only 32 nodes?By connecting parallel how the differences in the supply voltages between nodes adjusts? While difference in voltage determines the one and zeros why common wire to be connected? Hi there, there is only 32 nodes, because that is all the protocol allowed for when they made it (i think from memory), it’s just a design thing, it could be more. DeviceNet for example supports only 64 nodes. For the engineering behind it, you need to study communications engineering, as part of an Electrical/Electronic Degree course at University. Basically the cable limits are to do with the voltage reflections and ringing that will be produced when the voltage is pulsed down the wire, capacitance etc. will effect the rise time, and as you increase the board rate, the width of the pulses become shorter, hence there is less allowance for ringing, caused manily by poor cable installations. Hence why you can get away with bad cabling for low boad rates, but not for higher rates, as the ringing will be too much and the devices will not be able to determine the difference between the logic 1 state and the logic 0 state of the pulses. Another good idea for noise immunity is to use bus polarization, e.g. to insert a bias resistor network on the bus. I am a digital content manager at CFE Media, which publishing Control Engineering, Plant Engineering, and Consulting-Specifying Engineer. I would like to offer you a publishing opportunity at Control Engineering. Would you be interested in writing one, or a series of articles to be published on our website and possibly print publications? In some cases , Our communication system(RS 485) is working fine. but the slave port is failure. At the time can we check the system through Multi-meter? how much voltage will flow through the terminal A,B? In BMS, am facing many problems while communicating the VFD through controller. Kindly provide some troubleshooting ideas. You are really doing great service to the electrical engineering fraternity. In order to disseminate the information, can we publish the articles in some other forums?? Pl. let me know, so that young engineers can be provided with basics as well as in depth knowledge on electrical engineering subjects.